It’s that time of year again. Advent calendars are being opened, presents purchased and the tabloids are preparing their ‘outrage’ pieces about vital Christmas works. 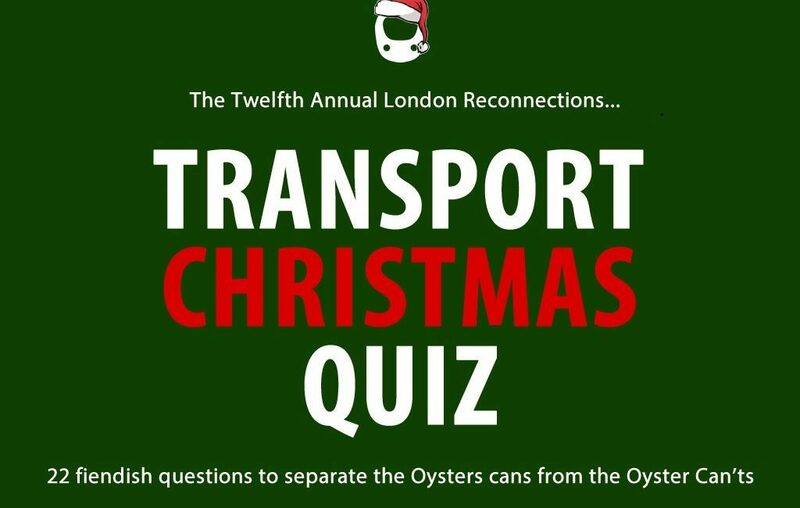 That means, of course, that is time for the London Reconnections Christmas Transport Quiz. An annual tradition, the Christmas Quiz tests not only your transport knowledge but also your ability to think laterally. The questions are intended to vary between easy and difficult, but not impossible – or at least not impossible to have a plausible guess at (perhaps with a bit of creative searching). Don’t worry if you can’t get them all – most people won’t. The fun, however, is in the trying. Don’t be put off sending in your answers if you haven’t got everything – because it is quite likely others are in a similar position. We try not to ask trick questions, but won’t hesitate to put you off the scent occasionally. On picture questions, there may be a bit of a clue in the name of the image. Most of the questions are about London but we may stray well beyond that geographically, if not thematically. In an act of desperation for some good questions we have recycled some answers from previous years – but rest assured the questions are very different. For once we haven’t any question specifically about the Metropolitan Railway, though we can’t promise that ‘Metropolitan’ won’t appear somewhere! We are aware of our embarrassing failure to deliver on prizes in the past. Whilst it is meant to be a bit of fun we do aim to acknowledge success and we have made a start of acquiring a cache of token prizes for past and current winners. As always though, the real prize is the opportunity to demonstrate your superiority over the LR Towers brain trust and your fellow readers. For this reason, please be aware that any answers (or clues we think are too obvious) will be deleted from the comments. If you work for a transport company and are sitting on some interesting potential prizes though that you don’t mind sharing, then do get in touch! The closing time and date is 23:59 GMT on New Year’s Eve. We aim to publish the answers at 00:01 on New Years Day. Sometime after that but, not too long we hope, we will publish the winners, identified by a suitable pseudonym agreeable to them, and an analysis of how people, in general, got on. Each question or part of a question normally carries one mark. It is relatively obvious where this is the case. Please send your answers to [email protected] with the word “quiz” in the subject line. If you send multiple submissions then only the last one we receive from you will be considered. Please don’t send partials and then expect us to stitch them together. We have better things to do and the festive alcohol won’t drink itself. Can I have the answers for my Christmas party…? For obvious reasons, we won’t give out the answers to this year’s quiz ahead of time. If you’d like a collection of previous year’s questions and answers for use at this time of year, then simply email us at [email protected]. And now on to the questions. A merry Christmas to you all from LR Towers! As at December 1st, what have the following events in 2018 got in common? 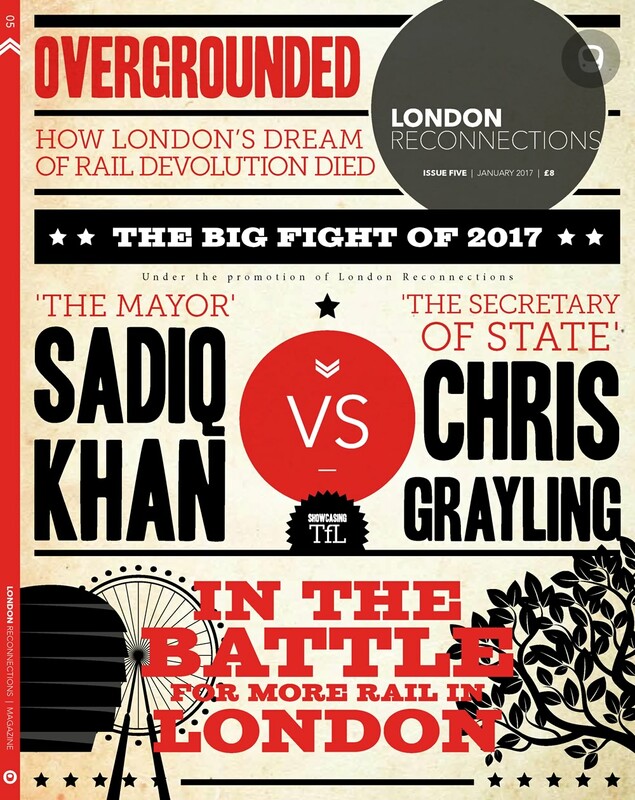 2018 was probably not a good year for TfL in the courts. On a positive note for them, what injunction did TfL manage to get lifted in 2018? What is the only TfL service where (according to TfL themselves) passenger satisfaction increases if the service runs slow? What TfL service, as of 1st December, has been closed for around 7 weeks in 2018? What is the only station on the London Underground that still officially has a ticket office in use that is run by London Underground? 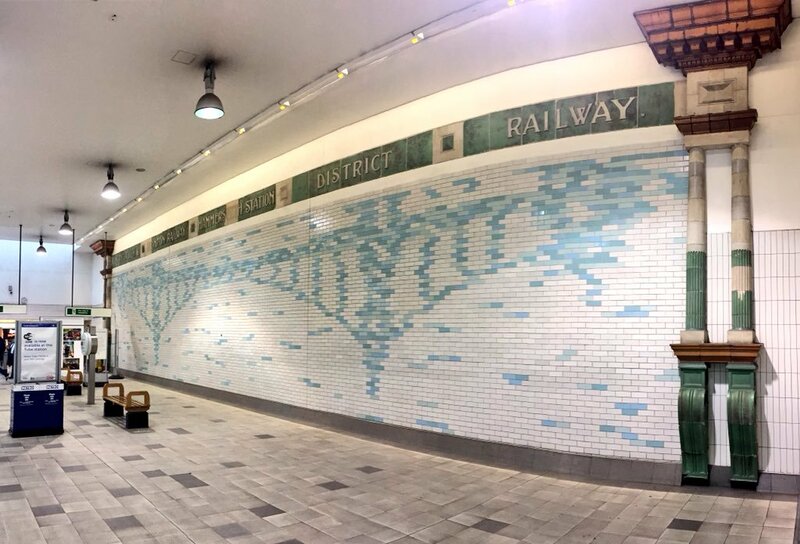 A picture question: What ‘London’ station am I? Name any saints that have two former or current stations that reference their name. The pairs of stations in question must both be within the London suburban rail and Underground network. For the purposes of this question, the London suburban network is the area covered by Oyster. Any recognised name of a station that has had multiple names during its existence is allowed. You cannot use ‘All Saints’ as one of your pair – they must be specifically named or referenced. Also, stations must be distinct and not merely part of the same complex although they can be located in fairly close proximity to each other and still qualify – but we are really after stations that are a considerable distance apart. St Pancras definitely doesn’t count as a valid answer. If two stations refer to the same named saint but they are in fact referring to different saints then, as far as we are concerned for the purposes of this question, they count as being the same. One mark for each saint identified. If the stations concerned are not obvious it might be a good idea to include those in case we overlooked some answers. If you’d been at Clapton Junction in 1909, what British transport first would you have seen? A question that could perhaps be considered related to the previous one. What do King’s Cross, Manchester Piccadilly, York and Uppsala Central all have in qommon? On a dry February day at midday, a man catches a train from Kings Cross to Sydenham. He exits the station for ten minutes before re-entering and catching a train to Regents Park. He leaves Regents Park station for ten minutes before re-entering and catching a train to Epping. 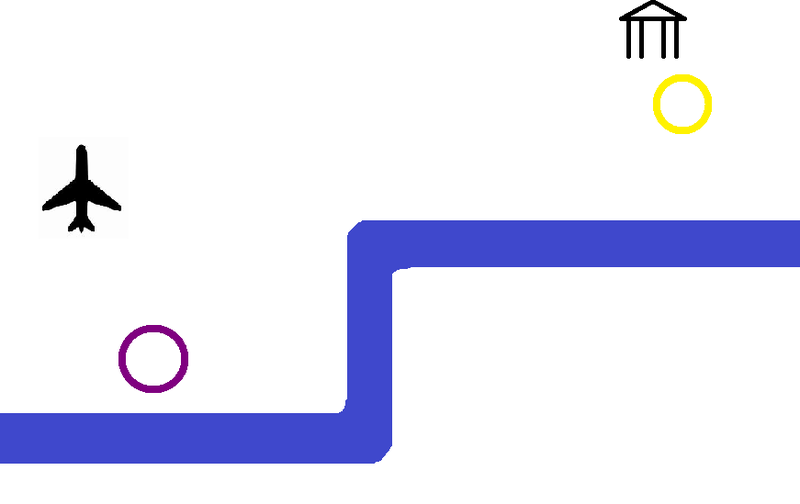 This final journey involves a change of train and the train taken for the second leg, by a slightly indirect route, travels fast through Lewisham station without stopping. 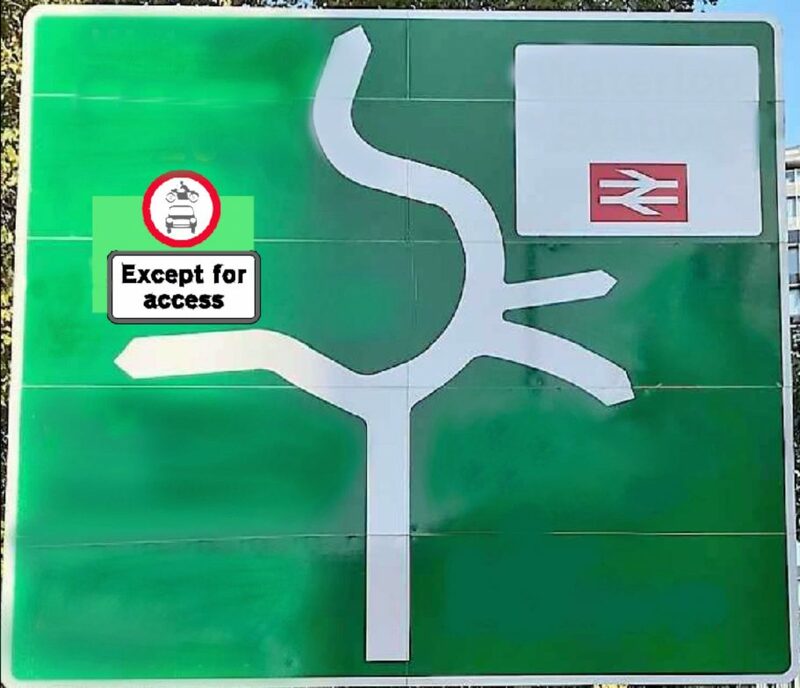 This picture, valid at December 1st, is a road sign in London with the text removed. Where is this sign located? At the turn of the century before last, it wasn’t uncommon to see the Duchess of Argyll, the Duchess of Hamilton or the Duchess of Rothesay at King’s Cross. What is so unusual (at least from a railway perspective) about them? a route that was created out of the southern end of one of the longest routes in London (and was initially designated that route number but suffixed with an A and then prefixed by a 3 but dropped the A). It itself was substantially cut back to roughly half its original length. Clad in iron at the home of tin, a small piece of me can still be found. A quiet relic of a local history, proud. What am I and where on the London Underground will you find me? Name the two former or current railways shown on the diagram. For seasoned quizzers, working out where we are will be easy. But what is depicted on the wall? 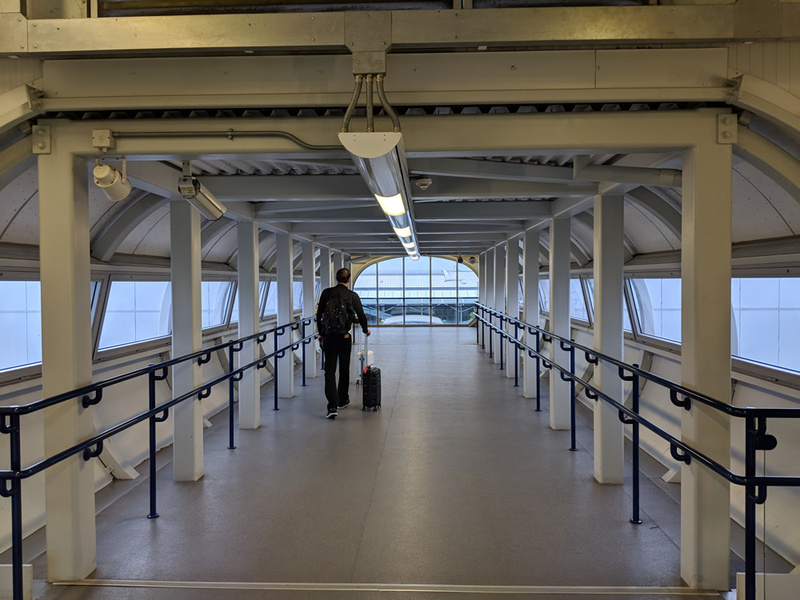 As of December 1st, what is the cheapest possible walk-on fare (without discount or concessions) on a non-stop train from Paddington to Heathrow Terminals 2 & 3? And when can it be made? By walk-on we mean not bought in advance prior to reaching the station. Payment can be by Oystercard or cash. The above list consists of four pairs of locations. What is the common feature that connects the first and the second of the pair in each case? In one of the cases the common feature is slightly different from the other three. Which is the odd one out and why? Which northern railway, with a 73 year-old history, struck a solid blow for equality in 2018 when its previously-perceived all-male department became 50% female due to a new intake? A description of the railway is acceptable if the formal title is not known. What no longer has the hump and will see trains in the next year or so? Meanwhile, changes at the nearby station might make some people cross as they will have difficulty getting across. a) At one station in 2018, as a result of an increase in service frequency on an all-stations service at this station, on a line that serves this platform, the number of trains using the platform was substantially reduced. Name the station and the platform. b) A station within Greater London is expected to gain an extra platform in 2019 which logically ought to be numbered platform 0. Which station is this and where is there another platform 0 ? (already in use). There may be more than one other platform 0 already in use but we only need one example. c) Which station doesn’t have a platform 13 but does have a platform 12 and a platform 14? I think I can get more than 2 right this year, excellent! In question 13 I straight away knew the bus that goes from a Park to a Square because I used it earlier this year! Question 9 asks what 4 locations have in qommon. Is that a typo or a subtle hint? It is in the nature of lawyers to ask pointless and inconvenient questions on ultimately irrelevant matters of detail, especially involving terminology. Firmly within that spirit, does the reference to ‘injunction’ in question 2 encompass an automatic suspension imposed by legislative obligation or does it refer only to an obligation imposed (and now, from the question, suspended) by order of the court? A none-to-subtle hint. But it is not a question of mine and I think I would find it very difficult without it (especially if you don’t have the answer to the previous question). Q5: One assumes that those large stations with ticket/enquiry offices ( Liverpool St, Victoria, etc ) don’t qualify – you mean an actual separate ticket office? Q11: Why is a mouse when it spins? Sorry, but the question is a complete non sequiteur & is not answerable as posted. Q 13: “Serves Oxford Street” – Is this restricted to running along the street, or will crossing it, count as well – there’s more than one possible answer to this q, incidentally. At a first-pass with brain not seriously engaged I’ve got 11 either in whole or in part, but some are going to be as erm, “awkward” as usual, I can see …. Question 10 is my favourite so far. I love it. I’m uneasy about Question 5 being true, I think I need to go and double check for myself tomorrow. The TfL website provides self-conflicting information. I may be kidding myself but it seems I know the answers, on first read through, to about 3 or 4 questions. This is much more than the last couple of years where the questions have been impenetrable. After a little bit of effort I think I’ve sussed Q13. @Greg Tingey did you really mean question 11 being unanswerable there? Question 11 looks like one of the most answerable questions there (though I can’t answer it myself yet :P). They don’t count because they are not run by London Underground as stated in the question. I can’t see the problem. I think you might mean question 10. Merely because it is a non sequitur it doesn’t mean it can’t be answered. & is not answerable as posted. On the first part, it goes along Oxford St or part of it. There may be more than one answer but that is part of the fun. Can you find a set of answers that describe the four routes and have something else in common? As they are in numerical order you may be able to eliminate multiple possibilities – or not. I think 11 on a first pass is seriously good. You can check if you like but it is irrelevant. The question asks if it is officially there. One of the pages mentioning this on the TfL website was updated very recently suggesting it is still officially there. Bear in mind that, in practice, a lot of ticket offices were, in fact, closed when they were officially still open during various rounds of ticket office closures. In any case, my understanding is that the opening hours are very limited so you would need to go at the correct time. A more difficult question is: why is it still officially there? but I did not ask this as I am not 100% sure I have the correct answer. By the way, if people search the TfL website I suggest it won’t be an easy trawl as it isn’t obvious where to look this up. Yes, I did mean Q 10 – Finger/Keyboard problem! “qommon” – err … no. Question 11 is not as easy as you might think due to a factor I am not prepared to divulge. Oh well, I’ve got the answer to Q11. 🙂 And yes it is pretty sneaky but not impossible. @WW: In the spirit of Christmas, my current likely answer is that it’s behind you! Let’s be polite and say that page hasn’t been updated recently. Don’t waste your journey going there. There isn’t a ticket office there. And the hub page for the correct station in question doesn’t mention a ticket office so don’t even assume that the hub details will be any help at all. Q8: I must have gotten wrong, just seems waaaaaaay to easy! But the in past quizes I’ve been surprised by some of the answers! A little too Panto! It’s the same every year. At first glance I thought this is too difficult, I’m not going to spend any time on this. But then curiosity kicks in. So far I’ve worked out about half of them, but I expect the rest will take me until New Year. I too have found two possible answers to the first part of Q13, but only one of them fits the set I think the other three belong to. There are however more than one possible candidate for the last in the set. I presume you mean Question 10.
the actual journeys as mentioned … are impossible, both now & in the past. All together now: ‘Oh, no they’re not’. A case of the editor’s graphic skills exceeding his spelling skills I’m afraid. A terrific set of questions, probably the best mix yet. Thank you for the challenge! I really enjoyed the chance to use my crayons for Q10. I think I spotted Q11 quite quickly but there’s something that may not be quite right about that sign, and it will need a field trip when I’m next in the area. @Greg Tingey 11 has an answer that will seem completely obviously correct if/when you get it, but it’s basically complete luck that I was able to figure it out. I don’t imagine it’s impossible though even without my luck! Would anyone who has become aware of the correct answer to question 10 please be very careful what you say about it. The question is quite fragile, so even the tiniest hint might give it away. No-one has overstepped the mark yet. Come to think, the same observation could also be applied to several other questions. Please do all take care. Q7 is not as easy as you’d think it is. I do, at present, not believe that there can be five answers to it, but maybe you can prove me wrong @Timbeau. @ Herned: Found the junction too and I don’t see anything weird in the way the question is worded actually. Just PoP’s comment is rather confusing. Was able to do 5, 8, 11, 17, parts of 22 from my computer despite not having been in London for over three years. I’ll try to send my answers across the North Sea in time this year! Last year I forgot. Question 7 is one where more answers might turn up than even the question-setter envisaged, as happened last year with the Boxhill-Bexhill one. It will be fun to see the full list. Devising questions where the internet cannot help has always been difficult, but our setters have made a pretty good stab at it, in my view. Q 11: The sign has changed – according to Google Street View, at least, but the actual location is certain …. there are at least 2 correct answers to Q 7 – there may be others …. Note the reference to former stations – so presumably name-changes & closures are allowed? As for Q 10 the journeys, as apparently described are impossible: You can’t get by rail from Sydenham to Regents Park without at least one change, nor Regents Park to Epping via Lewisham without at least 3 changes. The specific “February Day” reference suggests a play, film, TV programme or book of some sort. Q 15 & 19: Yes, well – they need to be allowed to fester in the back-memory. For Question 11 it is enough to describe where the junction is and some description to orientate it so that it is clear what direction you are approaching it from. Or you can describe exactly where the sign is. I don’t actually know the latter myself but will check it on the ground before the end of the year. If you wanted to, you could explain why the man was wearing the items of clothing that he was. But, if you fully understand the question, I think that would be pretty obvious. That makes me wonder if I’ve fully understood the question then. For Q7 if there are more than two stations named after a saint, is that one answer or two? thanks, I was overthinking it then! For the saints (Q7), how many correct saints are required to get the point? You remarked about Bexhill/Boxhill last year, but only one answer was required then, so provided it was correct it got the point. This year the quiz is asking for a list of multiple answers which doesn’t just have to be right but also comprehensive (if I’ve understood the question correctly). There are some iffy answers, e.g. do St Pancras/St Pancras Intl/Kings Cross St Pancras count as different stations? I’ve got another saint which as far as I can tell is probably two different saints that happen to have the same name, would that be a correct answer or a wrong one? If there is an answer you don’t like in the list (e.g. you decided that the St Pancrases were all the same station and therefore not a valid answer), would the mark still be given? Re Q7 St Reatham and St Ratford don’t count! @Greg re Q11. The latest Google Street View of the sign was taken in March 2018. The question says “One mark for each saint identified.”, so if there’s three stations with the same saint, that’s one point and if you have one saint, you have a point. The stations must be distinct in the sense that they are not recognised as part of the same complex so St Pancras really doesn’t count. As a guideline, if it is raining and you can walk from one to the other without getting wet then that is treated as the same station referring to one saint. If there are two examples of stations (current or former or renamed) close by but there is no form of direct interchange then that counts and you get a point, begrudgingly. What I am really looking for are a number of pairs of stations (or former stations) in distinctly different locations that both refer to the same saint name in some form in their title. I would be really surprised if you need the fingers of one hand to count them all (and please no-one ask if the thumb counts as a finger). I have amended the wording to make this clearer. I love question 10, I’ve worked out the journeys (yes I can see it’s fragile, my lips are sealed) but I’m still pondering the reasons for the 10 minute stops. Are they important? Q10 I can think of a reason the ten minute stops might be important, but can’t say what it is without giving the game away. Q7 If St Pancras doesn’t count, I’ve only got five, not six. Well, if it were six hours the answer might be slightly different. I might enter this year. Two big clues in Q6! Q7 looks like fun. I think I have five saints so far. That’s one more than me then! Question 1 is always a warm-up question so isn’t meant to be hard. Hmm, I’ve got at least two solutions for 22b. If different saints with the same name count (I honestly thought they didn’t until you clarified; I think that concession makes the question too easy! ), for question 7 I have five and they all seem pretty obvious answers. I do wonder if I can find some more obscure ones with sufficient searching. Q9 – I haven’t got a clue about the answer, so Google Mapped Uppsala Central station and then spent an enjoyable 20 minutes following the delightful narrow gauge line that leaves at Platforms 9 and 10 to wind through the countryside to nowhere in particular. A very pleasant diversion for the, otherwise perplexed, grey matter. I thought I’d worked out Question 16 top right (assuming that is one of the railways to identify) but I can’t then tally my answer with what’s at right in relation to the thick blue line. Oh well. Think I’ve got 1, and 3; may be getting somewhere with 6, 8, 17 and bits of 22. And totally agree about the fragility of Question 10! Q11: Would the factually correct answer of “Outside my window” count? I can confirm that the question’s image is an accurate rendition. I’m in the same boat as Thomas Wood. I also think there are 2 equally correct answers to 22b. I presume you are referring to the existing station part. In that case I will amend the wording but you only need to supply one and will only get one mark. I think you’d have to say where your window was, though! 5. Two different official sources give different, and contradictory, information. 6. No idea. Are the inverted commas around “London” a clue? 7. I assume “London suburban rail and Underground” excludes tram stops, as there must have been innumerable stops in the pre-1953 network that would otherwise qualify? 14. Apart from now having a certain tune as an earworm, I’ve made no progress at all. 18. I have found a possible answer but, as with Q5, different official sources give conflicting information. (Does the journey have to be possible on Dec 1st, or would a journey available in the current timetable but only on certain days of the week be allowed)? 20. I think I know what I’m looking for, but haven’t found the answer yet. 22a. I can imagine how such a situation could come to pass, but haven’t identified somewhere where it actually did. Is it in London? For Question 19 I beleive one of the pairs has a connection with my sisters father in law if that is any help ! More than that I cannot say without giving a big clue. Re: 22b. No, I’ve got two answers for stations gaining new (logical) platform zeroes. For various reasons, I suspect there may be a third possibility, but I’m yet to pin it down. (Apologies for my belligerence with the earlier ticket office questions). In that case, same rules. Any one valid answer will do. It might be an idea to provide evidence. That is one thing about the quiz. We do not always ask ‘safe’ questions and I think we learn something ourselves after each quiz. Absolutely no apology necessary. It helps increase the intrigue. We try not to ask boring questions (except in the tunnelling sense – but there are none of those this year). 5. There may well be contradictory information but my understanding from one of them is it is still open. There is really only one candidate so I suspect you have the correct answer. 7. Yes tram stops are excluded otherwise, as you say, there would be far too many. 14. Surprising because I thought that the question is really easy. But you have to tackle it in a certain way. 18. The journey has to be possible as of December 1st but not necessarily on December 1st So any journey at any time in December would qualify. It does not even have to be a regular service so if it can’t be made after Christmas (for example) that doesn’t matter. I hope that clarifies without giving too much away. 22a. Most definitely, unarguably in London by any reasonable definition. Is the station in 22c also in (some definition of) London? Getting stuck on the identity of The King of Love. Is there any reason why the blanks for the three words are different lengths? I have *an* answer for that one but I don’t feel very confident with it; it might very well be wildly off the mark! If I’m right, though, the word lengths have no significance. I found Q14 easy once I’d fired up the search engine. It helps if you don’t think only of omnibuses. Two left here. I’ll work out one but the other is going to be a stab in the dark. I’m confident about the majority of other answers. Good to see that lots of them are definitely not directly Googleable; answers to some questions that others are struggling with are right here on this website. But not Question 10. Thanks Pedantic and all, very enjoyable. 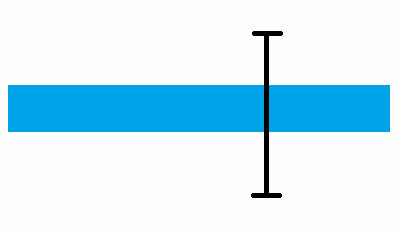 In Q14 there is absolutely no significance to the lengths of lines. They were crudely randomised so as not to give a clue – but that statement in itself is a clue although the very smallest of ones. Actually it’s Q 10 that really floors me. There are others where I have either no answer, a very tentative answer or a partial answer, but seem answerable, if not by me (!). But q 10, as phrased, is completely impossible. Certainly if, as implied one is using a train the whole time. The only get-out I can see is that this is a reference to some film, book or possibly TV programme, that simply ignores the facts of london’s actual geography, as all too many do. 19. Inspiration at last. Even though my hunch was wrong, it led me in the right direction. 20. No, I was on completely the wrong track. I think I’ve found it now though. Although its official history suggests the railway in question is considerably older than that. Greg – hold that thought. I think I may have cracked Q10 and I have a more specific answer than my initial offering. Identified all the bus routes in Q13 and have a plausible connection between them, although I can’t find evidence that one of them fits in. Q19 is doing my head in. 21 & 22a, I have an idea on which railway/line these locations must be, but can’t point out the exact station. 13, Not able to find the fourth bus route. Is there a clue in the wording of Q2? No. It is a straightforward question. We haven’t got devious yet. Hmm. While I haven’t got the ‘what’ for 21, I’m pretty sure I’ve got the ‘where’ and it’s not on the same line as 22a. 13d is definitely there. Make sure that you have the right answer to 13c because there is more than one possible answer to that, but only one which joins the theme with 13a and 13b. Once you’ve got the theme, there are only 2 possibilities for 13d, one of which is almost a straight line so can’t be a “circuitous route”. The narrow gauge line at Uppsala is a ‘heritage railway’, and a very pleasant trip too. There are more direct alternatives to both possibilities for 13d, but one is much more circuitous than the other. By lucky circumstance I happen to know the answer to number 10 so it has been amusing reading the frustrations of others. However, I can’t be too smug as I haven’t a clue on most of the rest of the questions. Anyway, thanks to both the setters and the commenters for another very entertaining quiz. Re: CJW714 – It is, isn’t it?! I didn’t know it but found the solution with rather less effort than I expected. Oddly, I got Q10 immediately by thinking about the “what was he wearing” bit. No clues, but I’m surprised that a few more stations weren’t involved. Re: GT – Even if we hadn’t been barred upthread from saying more, you wouldn’t really want anyone to spoil it for you by doing so! What gets me about this question is the utter impossibility of the journey(s) as described. Greg: Indeed. And yet some people have an answer. When you either find it yourself, or read it after the deadline, I am quite sure that you will accept that it is a valid answer and that it was a good question. It is probably best not to probe for hints. The question is such that any hint will either be useless, or a giveaway. If any such hint is given, whether deliberately or inadvertently, most of those who did not already know the answer will be annoyed that they did not have the full month to find it themself. Hence the request for schtum (*). (*) an adjective that I have just nouned. A bit of digging found me No 6, and a chance remark on another website led me to 22a (which I should have got sooner as I was at that very location only last week). And I’ve just realised that No 14 was staring me in the face all the time. Still no idea on Nos 9 and 15. I must admit I was surprised that you had such difficulty with Question 14. Q15 is bugging me as I’m sure I have read about something which fits the bill… but can’t remember where. If Q22a is where I think it is, there are actually two platforms which have had a reduction in the number of trains calling as a result of the increase in service frequency. Do we get the point for either of them? Without commenting specifically on Q22a, the general principle (if the question asks for one item and you give two) would be that if both of the alternative answers you supply would fit the question, then you would certainly get the point. If one is correct and the other is not, then it would be adjudicator’s discretion, probably based on whether the said adjudicator thinks you are trying to game the system, or not. To take it to an extreme, if you answer any “which station…?” question with a full list of all stations in the world, you would not get the point, even though the required answer may well be in the list somewhere. For 22a, the intended answer definitely only has one platform with a reduced service. I would be surprised if there is an alternative answer where two platforms get a reduced service. I would be even more surprised if this happened as as a result of the increase in frequency. We need causation not merely correlation. OK, I was mistaken that the change in platform arrangements at the location I had in mind was consequential on a change in service frequency. The search goes on. Q16 – I came up with two potential answers for the yellow line, but on closer inspection only one is actually valid, especially if I’ve correctly decrypted the hint in the caption. I’m with Timbeau that one element of Q16 might lend itself to various interpretations. However that might not affect the required outcome. Well I will tell you now the yellow circle does not depict the Circle line. Any more than this picture represents the Waterloo & City line (Q14 from 2012). I’m now at the stage of having horrible suspicions that I actually know the answers to several Q’s, but can’t put my finger on them: .. 13c & the connection, 15, 19 & 22a. But no guarantee that those which I think I’ve solved are actually what’s being looked-for as the “correct” answer …. In other words, about par for the course! PoP – re. Q. 16 I suspect the hint is the phrase “former or current” – one should, perhaps refer to Cobb, or any good history of the UndergrounD? I can only say I do not have ‘Cobb’ and my only knowledge of it is that you refer to it sometimes. Lt-Col Cobb collected & published under the auspices of Ian Allen a massive annotated atlas of the railways of England, Scotland & Wales, showing opening & closing dates of every stretch of line & stations on them, plus the ownerships & titles. With an heirarchy-tree appendix of all the company ownership structures. In which case it may, or may not, help. Next you’ll be saying that the purple one isn’t the Piccadilly loop at Heathrow?! For Q21, is it safe to assume that “will see trains in the next year or so” means that ‘it’ doesn’t ‘see’ any trains *at all* right now? Or will it be seeing new/additional trains, possibly on tracks that are not built yet, are not presently in use, or are in use exclusively for engineering and/or test trains (I think that covers all possibilities to keep it sufficiently vague), while existing trains on existing parallel tracks that ‘it’ can ‘see’ are presently running? Finally got an answer to Q15, but only if a pretty awful pun is involved. For Question 21 there are no trains there right now. Nearby there may or may not be trains. The point is you can’t ‘see’ any trains at the exact location. It is irrelevant what is going on beyond that immediate area (where there may or may not be trains). Yes, well, I’ve done that in previous years, but got spectacularly wrong answers …. Answers submitted. I’ve given up on Q14, but have something for everything else: will be interested to see — as Timbeau and Greg note — whether they’re remotely correct! Pretty sure that my answer to Q21 is not what the setters intended but it does fit every single part of the question. I’ve got (and checked) 1, 2, 5, 6, lots of 7s, 8, 10, 17, 18 and 22 so far. I think I know 3,4, 11, 12. I’m glad there are a few weeks left…. Q20. A 73 year old history as distinct from a 73 year history? Question 7: Refers to 2 stations. Would I case of 3 stations not count, then? e.g St. Reatham, St. Reatham Hill and St. Reatham Common? I assume they would count (if valid) – but only as one saint, not as three pairs. If a given saint has 3 stations named after him/her, then a fortiori they have 2. Admittedly a tricycle is not normally considered to be a bicycle, even though it has two wheels (and then another wheel). But it would be a cruel adjudicator who excluded such a saint (if there is one). The marks will depend on the number of saints-names matching the criterion, though, not the number of stations. So even a saint-name with 4 or more different stations will only earn one mark. As stated, if there are three stations then clearly you can pick any two and get the point. Since it is one per saint you can’t then pick a different pair and expect another point. No-one has pointed out that there is an example of four different stations that at one time (not necessarily the same time) refer to the same saint. @PoP: I beg to disagree with the strike-through statement, we’ll see after the deadline whether I’ve been too creative! I don’t pretend to ‘win’ this question though, I didn’t get past 4 saints yet. I may have found another saint. Would stations like Bushey Heath, which were authorised but never built, count? If you’re trying to pair a closed LNER station with an authorised-but-not-built tube station, you don’t need to. There is another station which references the saint in question, although the reference is somewhat indirect and it took a bit of digging to confirm that it was a saint and not royalty. Add that to one which meets the letter if not the spirit of PoP’s definition of what will be permitted plus 4 completely legit ones makes 6. When the answers come out it would be interesting to also see a list of saints that had been submitted but rejected and reason(s) for rejection. I think I am starting to regret setting the saints question. Definitely not. I am regretting not restricting it to current station names of stations currently open. Also I should have required the stations to be a minimum distance apart to preclude multiple stations clearly named after the same area or religious building. 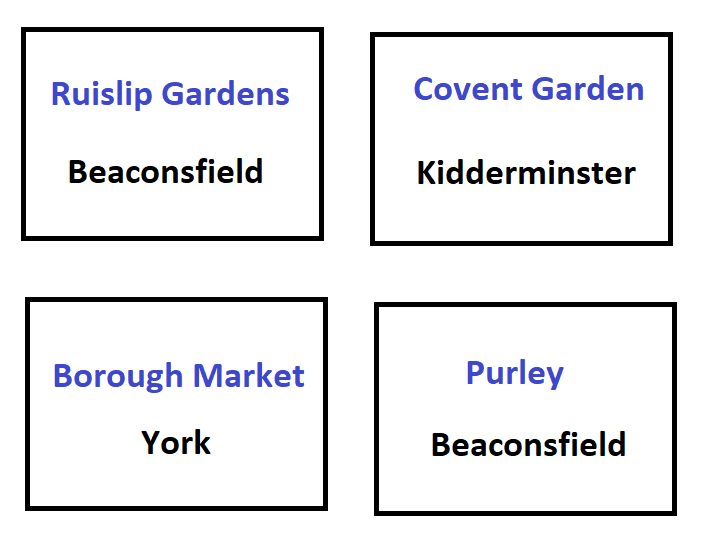 So any pair of station names, past or present, that were actually in use in the current Oystercard area – but they have to be two distinct stations not physically connected (so St Pancras doesn’t count). And, for completeness, a station that is relocated (old station closes and almost immediately new station opens not far away with the same name) doesn’t count. @Moosealot: I know which station you’re referring to. I didn’t mean that one. Being mildly interested in church history I also think it is a pity that stations referring a different saint of the same name count – this way people don’t need to look at who the saint in question was. I thought it was a great question. If people weren’t trying to pull this question apart they would be attacking one of the others — this is the LR commentariat, after all. And, for completeness, a station that is relocated (old station closes and almost immediately new station opens not far away with the same name) doesn’t count. I know which station you’re referring to. I didn’t mean that one. St Cedd was a Bishop of London in 653 it turns out. The question clearly starts with “Name any saints that have two former or current stations that reference their name.” To me the word “reference” suggests that the station does not have to be “named after” the saint in question, it just has to have their name as part of the station name. (Indeed in some cases it may be impossible to find out exactly why a company gave a particular name to a station). So if St Pancras had actually been named after Prince Pancras of Baden-Wuttenberg, it would not matter, as there was a real saint, whose name is referenced by the station name. (Though as mentioned above, there is only one St Pancras station for the purpose of this question). (Subject to a further ruling, if any, by Pedantic). I still recall Alan Bennett giving a comprehensive presentation on late evening TV in the late 60s/early 70s, about the design virtues of St Pancras ‘Cathedral’, in that semi-religious tone that he can emulate so pontifically. If it is clear (and generally not disputed) that it refers to a saint then it counts even if the word ‘Saint’ (abbreviated to St) is not explicitly stated. But, if there were a St Victoria, you couldn’t list of stations with Victoria in the name and expect those to qualify. Similarly, if you had a station call ‘Patron saint of travellers station’ then that refers to a particular saint even if the saint in question is not mentioned by name so would count – but I am pretty sure there are no such examples so don’t waste your time. Now I’m intrigued, because the closed LNER station I had in mind had a very obvious namesake (also closed) not far away but not part of the same complex. There is a also a tram stop but they don’t count. Surely the station has to include the actual name of the saint to count? Technically no but I am sure this is irrelevant as I really doubt if there are stations that refer to a saint without actually giving the name of the saint (even if not the ‘St’ bit). There may be “only one St Pancras station for the purpose of this question”, but there is at least one other completely different station bearing the saint’s name (though out of bounds for the purposes of this quiz). San Pancrazio Salentino station is on the Ferrovie del Sud Est, near Lecce in southern Italy. It used to be possible to travel almost the full length of Italy from San Pancrazio to Derby, near Aosta, though I doubt if anyone ever did. Sadly, the railway through Derby closed in 2015. Stations which reference specific saints without actually naming them. I can think of one, but although it’s not in London I won’t identify it as the same saint is referenced, by name, in two London stations. I’m sure there are other examples abroad. Regents Park references a specific king without naming him. That was a good answer…. Interesting. If that is the same one I’ve identified, the etymology is adverse for the origin of the London names, i.e. not saintly. However, so far I think I’ve identified 7 or 8 saints from relevant stations, excluding St. Quintin whom PoP has now banned! No doubt PoP will adjudicate with his normal no-nonsense methods. Definitely hagiographical etymology for both the London stations and the one referencing a saint. (Same name, although not necessarily all the same saint). I haven’t ‘now banned’ St Quintin. It was banned from the outset. All I did was provide ‘clarification’. One station, two locations not two stations. It is surprisingly difficult to find which, of several saints with the same name, a particular church is dedicated to. Of the five name pairs I’ve found, only two pairs definitely relate to the same saint, and a third probably does. For the other two, I can find no evidence either way. In that case I need to research further as your accessible hagiography is clearly more helpful than my French/AngloSaxon derivations! Noted. How far apart then?! PoP: Technically no but I am sure this is irrelevant as I really doubt if there are stations that refer to a saint without actually giving the name of the saint (even if not the ‘St’ bit). I hope to surprise you in 2019. Now I really must not forget to submit my answers before the deadline like I did last year. I think I’ve got where you’re thinking of. Very good. A bit late to the party but Question 10 made me laugh. Might there have been a reason for the ticket office referred to in question 5 to be open today by any chance? I don’t know why it shouldn’t be open? The office in my answer (not 100% sure it’s the right one) is open today. Answers or part-answers for all Q’s just sent. Accuracy NOT guaranteed, of course! Since I’ve noticed that the banner on the LR home page says “twelth” annual quiz, I can’t stop this typo glaring at me, so I finally get round to looking at the actual page and, blow me down, it says “twelfth”! So can we fix the reference on the LR home page, too, please? The image on the actual page is part of the article and can be corrected by anyone who has access to articles. In fact I corrected this as soon as it was pointed out. Unfortunately, editing the home page requires a higher level of access. I will say no more.